Hey! Welcome to my 2nd Summative Blog, my Aperture Control portfolio. 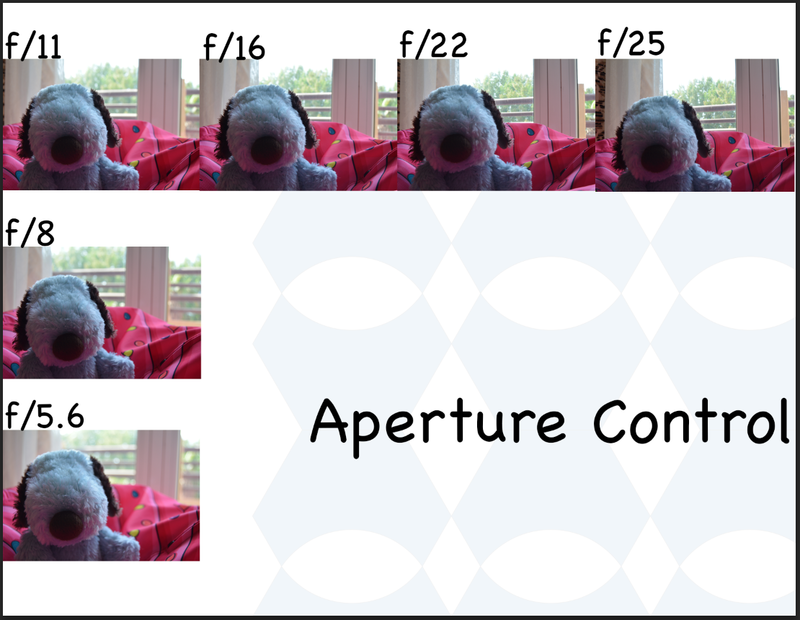 For our 2nd Summative in Photography, our assignment was to take 4 sets of photos of Aperture Control so that we can demonstrate the skills we learnt in this unit. In the final product, they should look like Web Page Designs, the information and images should not be too crammed but not too sparse either. The learning I brought to this project was that I used everything I was taught in the formative classes to produce my final summative portfolio. I learnt a lot of new things in these past few weeks after the break. I continued to progress and improve my skills in PhotoShop, I learnt how to create radial patterns in Illustrator (something I really enjoyed doing), and I understood how Aperture can change photos that all look similar if you don’t look close enough. Every time the Aperture stop gets higher from f/5.6, the focus of the background gets clearer. Every photo has a main focus (a face/ an object) which should always have a sharp focus while the background blurs or gets clearer depending on the f/ stop. In this art project, I tried to use all the skills and techniques I learnt in class. I also investigated several buttons and tools found on the Adobe programs (Photoshop, Illustrator). One choice I made was to experiment with background designs on the documents that presented my sets of photos so that I could get a variety of results and choose the best backgrounds for my final. Something new I learnt was how to control the Aperture on my camera and how each f/ stop changed the background blur. Something I would change would be to have taken photos of more than just one object. 3 out of 4 of my sets are all photos of my stuffed animal Snoopy, in my opinion I think that was a choice I made because I wanted my viewers to see how different each set was to the other even with the same subject (Snoopy). My fourth set is of a flower I found near the ASD library. Therefore, perhaps I needed to vary my sets a little more, but in this case I think that was an artistic decision I made, and I am very satisfied with my decision. Below, I have displayed my final 4 Summative sets of photos for Aperture Control. Each one will have a short description as to why it is my final product and what process it took to create the final piece. For my Aperture Control set, I took several photos of Snoopy (my stuffed animal) sitting on my bean bag. If you look closely, each f/ stop has a different background blur, so as you go up from f/5.6, the focus of the background gets clearer. To get to this final product, I took a lot of photos of Snoopy so that I could get him to be the same size and at the same corner in each photo. I made the background design in Illustrator by cutting a circle out of a pentagon, copying it several times and arranging it so that it made ellipses as negative space. My font for the f/ stop labels and the title is Chalkboard, I wanted it to be consistent for each set. In my Zoom With Lens set, I took another collection of photos of Snoopy sitting on my bean bag. The photo on the right middle of my page has no zoom at all. The photo on the left bottom corner of my page has maximum zoom. I was about 10 steps away from Snoopy for each photo, but I used my camera lens to zoom in as if I were walking up to him. To get to this final product, I arranged and re-arranged my set of photos until I was satisfied with how they were displayed like they are right now. I like how it goes three, two, one. I made the background design by cutting a circle out of a four-sided star, then arranging it to look like it does now. My font for the labels and the title is Chalkboard, once again. For my Zoom With Feet set, I took yet another collection of photos of Snoopy, though this time he is laying on a bed. The photo on the top right of my page has the farthest feet zoom. The photo on the left middle of my page has the closest feet zoom. To get to this final product, I took photos of Snoopy until I had a very zoomed in view of him (as much as my camera’s lens could go). I made the background design by editing my radial pattern that I did in class so that it is not too obvious but not too transparent either. It also has a very nice design, and I am very proud of how it looks now. My font for the labels and the title is Chalkboard, yet again. 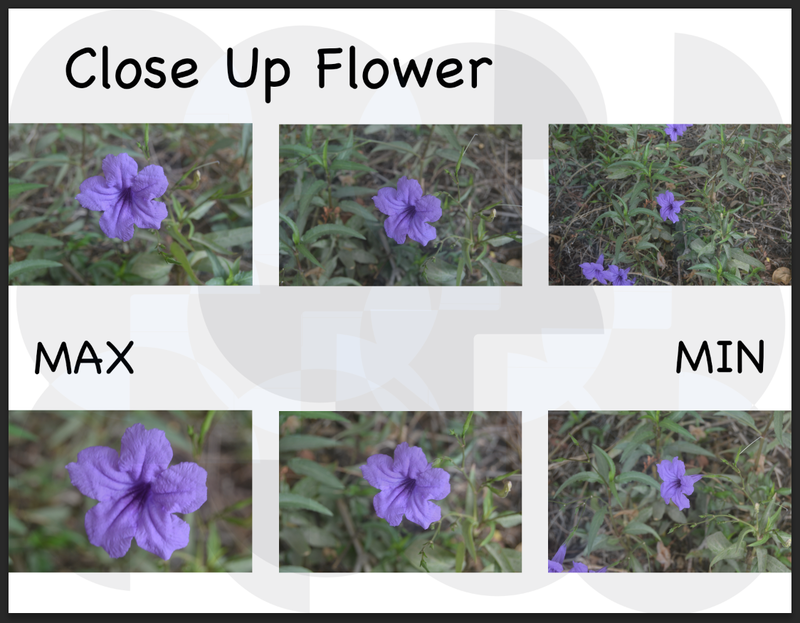 In my Close Up Flower set, I took a collection of photos of a purple flower outside the ASD library. The photos on the right side of my page have minimum zoom. The photos on the left side of my page have maximum zoom. If you haven’t noticed already, the top photos are zooms made by my feet. The ones on the bottom are zooms made by my camera lens. 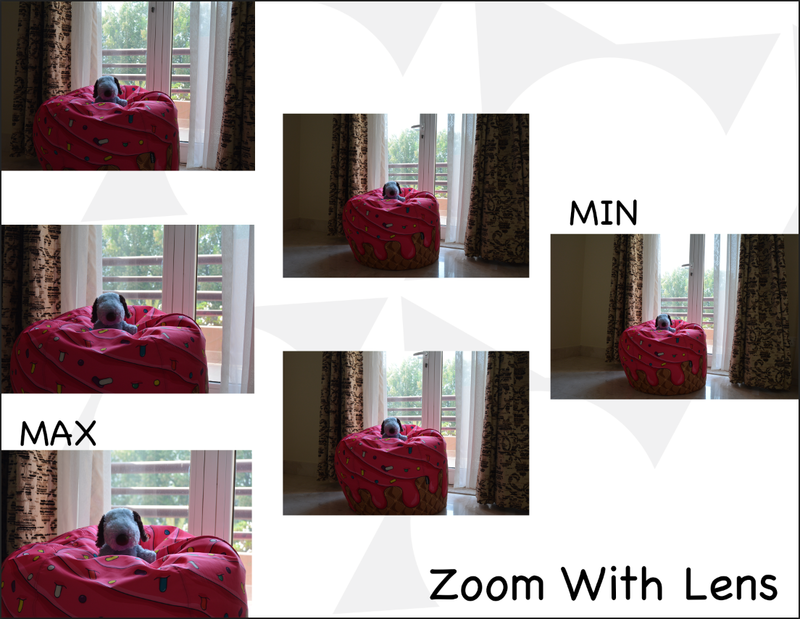 After arranging the six pictures on my page, I realized that the lens’ zoom was much more accurate than my feet’s zoom. It looked better and I could get closer to my flower with my lens’ zoom. To get to this final product, I kept thinking of ways to arrange my photos in a cool and unique way, so although the top and bottom photos are not made by the same zoom, they are brought together by whether they have minimum or maximum zoom. I made the background design by cutting rounded rectangles out of circles and grouped them together, then I copied that and rotated it so that it now looks like a flower. That was very cool because I hadn’t intended it to look like a flower but it did, so I used it represent my flower set.